Owen Franklin celebrates after hitting a three point shot, causing Hillman to call timeout. Franklin had 23 points for the Owls in their win. 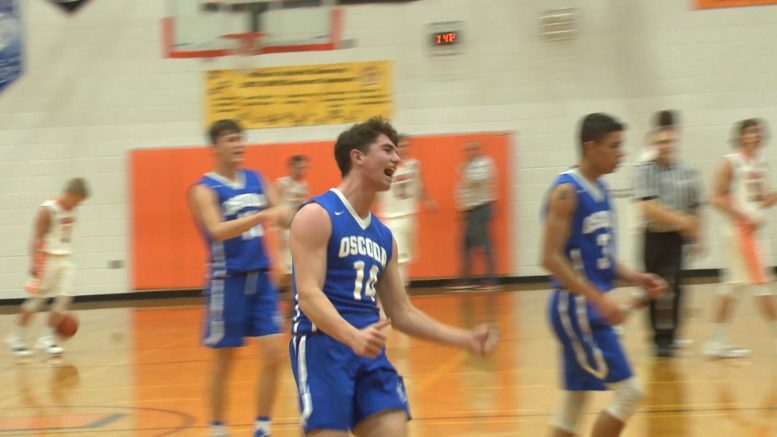 HILLMAN — Both the boys and girls Tigers basketball teams opened their seasons against the Oscoda Owls squads Monday night. The lady Tigers played first as they looked to pick up where they left off last season. They went 19-2 a season ago but only have 6 players on their varsity team and one who rotates between varsity and JV. Oscoda’s varsity team is also only comprised of 7 players. The Owls were aggressive from the start, playing a full court press and shooting threes. Brooke Nowiski took and made threes constantly, helping Oscoda jump to an 18-8 advantage after 1. They led 40-10 at halftime as Katelyn Etherton nailed a 3 point halftime buzzer beater. Both offenses slowed down in the second half. Etherton and Macy Kellstrom combined for consecutive fast breaks in the fourth, while Lauren Langley picked up points in the paint as the Owls pulled away with a 68-18 win. In the boys game, Hillman started with excellent tempo and took an early 4-0 lead. The lead was short lived as Oscoda, led by Owen Franklin and Gabe Kellstrom, scored 19 unanswered points. Hillman’s Nic Taratuta ended the first half with a buzzer beater of his own to make it 7-19 after 1. The Tigers started the second quarter with a 7-0 run of their own. They held Oscoda to 8 points for the quarter thanks to strong defensive play from Taratuta and Kory Henigan. Hillman did have some foul trouble in the first half as the team combined for 10 compared to Oscoda’s 3. Oscoda ended up winning the game 53-47. Franklin, who netted 23 for the Owls, was assisted by Kellstrom’s 21 and Brayden Mallak’s 6. Alpena High School Adds 1 More Name To The 1000 Point Club!